The aft section of the docked space shuttle Discovery and the station's robotic Canadarm2 are featured in this image photographed by an STS-131 crew member on the International Space Station. 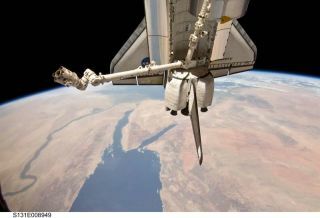 The Red Sea, Sinai Peninsula (center) and Nile River (left) are seen approximately 215 miles below. Astronauts on NASA's space shuttle Discovery packed acargo pod back inside their spacecraft's payload bay Friday and took one lastlook at their heat shield to look for any new damage. The astronauts used the space station's robotic arm to returntheir bus-sizedcargo pod Leonardo to Discovery's payload bay as they prepare to leaveafter more than a week at the orbiting lab. The shiny cylindrical module delivered more than 8tons of new supplies, science equipment and other cargo to the spacestation. It is now filled with trash and unneeded equipment to be returned backto Earth. "We'vegot a lot of work accomplished up here and we still got a little more,"Discovery astronaut Rick Mastracchio told Mission Control as the crew begantheir day. "We look forward to coming home soon." The 21-foot-longLeonardo module was actually supposed to be moved back to Discovery Thursdaynight, but some technical glitches delayed that work much longer than planned. Discoveryis due to undock from the space station Saturday at 8:52 a.m. EDT (1252 GMT). Discovery'screw stayed up extra late to try and finish as much of the cargo pod move aspossible after finally plucking it free Thursday. To make up for the long day,Mission Control let the astronauts sleep in Friday to rest up. TheLeonardo module, named after famed Renaissance artist and scientist Leonardo daVinci, is making its last trip to Earth on this mission. When Discoverylaunches to the space station again, it will carry Leonardo to the station toserve as a permanent attachment to the orbiting lab. Aftermoving the Leonardo cargo module, Discovery's astronauts switched robotic arms.They used shuttle's 100-foot (30-meter) combo of its own robotic arm andsensor-tipped inspection pole to search for any signs of new damage to the heatshield panels along their wing edges and nose cap. Knownas a late inspection, theheat shield survey is a now-standard part every shuttle mission since the2003 Columbia disaster to make sure a shuttle hasn't been damaged frommicrometeorites or space debris. Thesurvey is usually performed after a space shuttle undocks, but Discovery's crewhad the tricky task of inspecting their heat shield while still linked to thespace station. A mainantenna failure on April 5, the day Discoverylaunched into space, forced the astronauts to scan their heat shield whileat the space station in order to use the station's antenna to send the massivevideo files of the scan to Mission Control. The astronautshad to take extra care to avoid bumping any part of the space station and hadto work with some tight clearance issues. But despite those challenges, they actuallywere well ahead of their schedule during the inspection. NASAengineers on Earth will review the video and data from the heat shield scan tomake sure Discovery is safe to re-enter Earth's atmosphere. The shuttle's heatshield has already been cleared of any concerns related to launch debris. Discoveryis flying one of NASA's final shuttle missions before thespace shuttle fleet is retired later this year. Only three more missionsare left after this one, each one the last for the shuttle flying on it. Discoveryastronauts will have spent about nine days of their 14-day mission at the spacestation when they undock Saturday. They performed three spacewalks to make atricky ammonia tank swap among other maintenance chores during that time. Theshuttle is due to land in Florida on Monday at 8:48 a.m. EDT (1248 GMT).